Cystocarpium roskamianum, a common fern in parts of France, seems to be a naturally cross-bred product of two separate ferns. Ferns reproduce via spores. 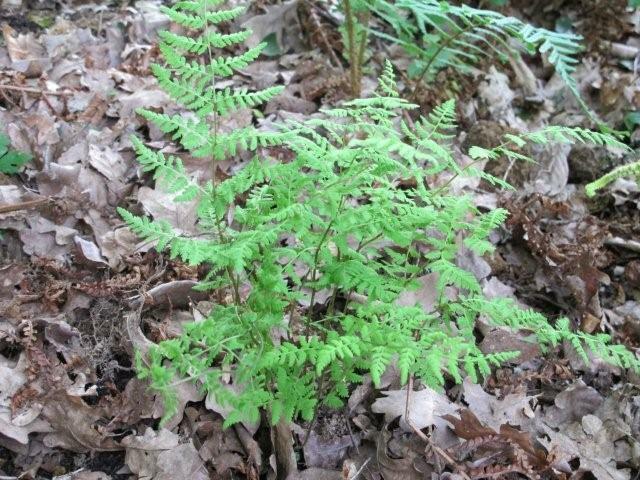 Read the DNA analysis here, decribing cystocarpium roskamianum as a hybrid fern with parents whose last common ancestor was nearly 60 million years ago. This hybrid is unique to the French Pyrenees but can be found in flowershops and greenhouses throughout Europe. It’s noteworthy as an intergeneric hybrid with lineages that have not cross-fertilized since that common ancestor. This is an extraordinarily deep hybridization event, roughly akin to an elephant hybridizing with a manatee or a human with a lemur. The research team went on to acknowledge that fern populations develop new adaptations slowly and with much overlap and shared DNA. Much of our planet’s biodiversity is dependent on cross pollination of species with complimentary traits as opposed to adaptive mutations that spur evolution in lifeforms of more diverse lineage. In other words, the history of interbreeding based on desirable traits runs 60 million years deep for ferns. Just because it’s the oldest common-relative hybrid on record doesn’t mean Cystocarpium roskamianum is hard to find. It’s a common hybrid that is found in areas where the spores of one species can blow via wind into the leaves of the other. It has an unconventional look for a fern but it’s easily identifiable and commonly found. Bird-men: “I think man has been trying to fly forever,” Kirby said. He approves of bird-men, he says, “if it’s a natural genetic mutation.” He acknowledges such a mutation could help solve Georgia’s transportation issues. The research seems to point out that ferns can easily interbreed with other ferns simply because they have not evolved genetic barriers that stop them from doing so. The implication is that other lifeforms have evolved an aversion or set of obstacles that stop crossbreeding in order to fine tune the speed of adaptation to suit each lifeform’s unique attempt at evolving.